As I left the office yesterday, I passed a billboard at a bus stop near the Canonical office. 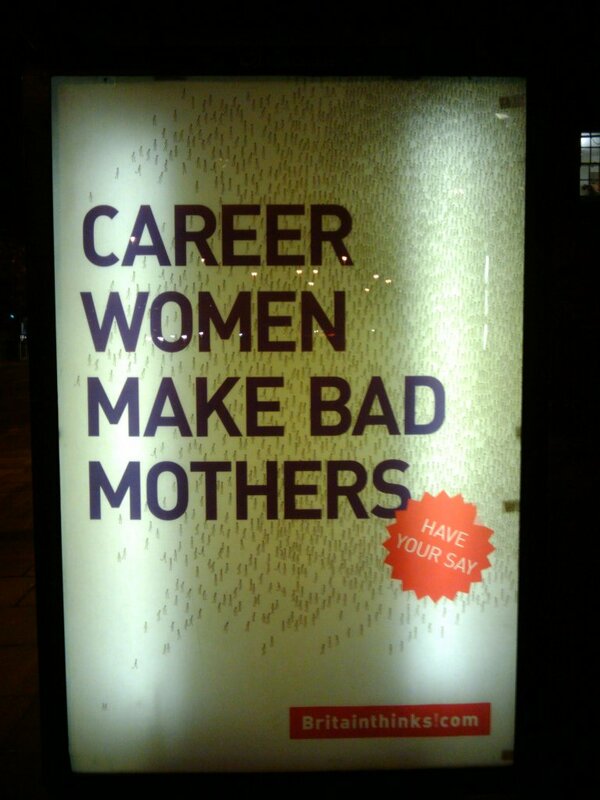 In large, capital letters, it read “Career women make bad mothers”. It invites readers to “have their say” on a website called “Britainthinks!”, which I won’t dignify with a link. I say it stinks. Who on earth thought this would be acceptable? This reminds me a bit of the BBC’s recent screwup, where they attempted to “spark debate” about whether gay people should be executed(!? ), and then defended their actions as intentionally polarizing. The common pattern is disregard for the rights of a class of people, followed by blind excuses and justification. It’s no coincidence that the target groups are routinely subject to harassment by more privileged folk.